Yes, it will be there, but not in alpha release. Please report an issue here: https://github.com/estevez-dev/ha_client_pub/issues/new with log output. Thanks. Played around a bit more with the app (now that I have created some views/groups in HA, whereas on the web I only use lovelace). Its surprisingly stable and fast already! With some extra functionalities - cover (up, stop, down) and dimmable/RGB lights I might even start using it on a daily basis already. I noticed by the way that many icons for entities show up in the app as well, but not all (f.i. 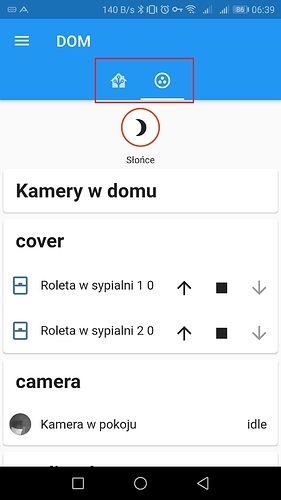 the cover and device_trackers). Covers is in work. Could I ask you to report an issue on GitHub about missing device_tracker icons with a screenshot. Thanks! Sorry guys for not updating the app, but I’ve lost my sign keys for app distribution =) Restoring is not a quick process, but new keys should be applied on Oct 10. I’m not promising to release tomorrow, but very soon. When will be available new update of app? Hi. I’m working on climate support now, there is a lot work to do. Also I want to add covers support to the next release as well. I think it will be released by the end of the week. Also there was a huge refactoring on how UI is built, that is why it takes a lot of time. Any hope for acceptance of self signed certs?? BTW. This is the best app for HA for Android I ever tried. Thanks for the efforts. BTW. Thanks! Nice to hear that. The next big thing is full lights (color, brightness etc.) and media players support. On version 0.3.0 still is problem with tabs. On task bar show two tabs but i can not click on icon tabs to switch. Only scrool tabs by scrool screen from right to left. So you can switch views by swiping left-to-right and right-to-left, but you can’t switch views by tapping it’s icon, Im I right? I am not having that problem, tapping and swiping seem to work fine. I had the swiping issue as well when i first started V.0.3.0.39 - it is working fine now after a re-start of the app. Will you ever support Tor-connected HA? Integration with Orbot so the app can connect to the .onion address.